Definition: Of course justice refers to ‘fairness’ but there is another meaning: Judges in the Supreme Court of the UK are known as ‘justices’ and in court are referred to as ‘My Lord/Lady’. There are a total of 12 positions in the Supreme Court consisting of a President, Deputy President and 10 Justices. They are extremely experienced and are appointed by the Queen on the advice of the Prime Minister who is in turn advised by a select committee. The original justices of the Supreme Court were the former judges from the House of Lords. IMPORTANT NOTE! : Do not confuse ‘justices’ with ‘justices of the peace.’ A person appointed to keep the peace as a judicial officer in the lower courts. 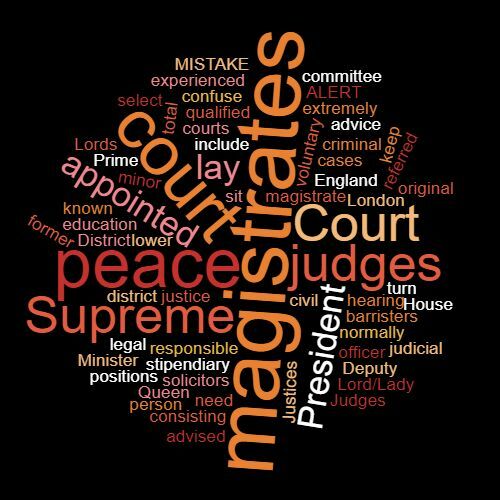 In England justices of the peace include lay magistrates’ and district judges of the magistrates’ court or stipendiary magistrates’. A lay magistrate is a voluntary justice of the peace and is responsible for hearing minor criminal and civil cases. They do not need a legal education. District judges of magistrates’ court are qualified solicitors or barristers and sit in the magistrates’ court normally in London. Example: Most cases in the Supreme Court require a sitting of five justices. This word features in Episode 49 of the Study Legal English Podcast.